The take-away from this session is pretty simple. To help facilitate professional development, NCTM has produced a series of free, online reflection guides that leverage lessons in NCTM journals. The idea is that teachers in professional learning communities can use these reflection guides to help focus their efforts around particular lessons. As an example, we worked through a problem presented in a 2005 issue of Mathematics Teaching in the Middle School. 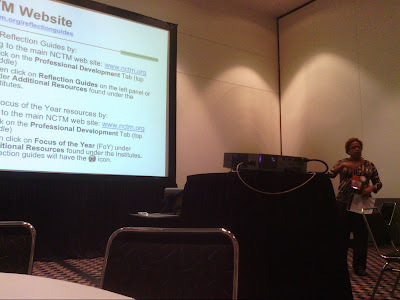 I left to attend another session before the ending, but the reflection guide and a link to the lesson can be found at http://www.nctm.org/profdev/content.aspx?id=23531. To see all the reflection guides, visit http://nctm.org/reflectionguides.